The iconic Pillars of Creation recently had their portrait retaken by NASA’s Hubble Space Telescope in high-def as part of the telescope’s 25th anniversary celebration. The new image — showing the trio of giant columns of gas illuminated by the light of massive stars next to the Eagle Nebula (M16) in def — is as striking as ever, this time though the image includes the infrared spectrum as well. Owing to the inclusion of the infrared spectrum in the new image, further details are now visible, as infrared light can penetrate through all but the densest portion of the dust and gas cloud, whereas visible light can not. Amongst these new details, are the now visible hints of newborn stars inside some of the pillars. 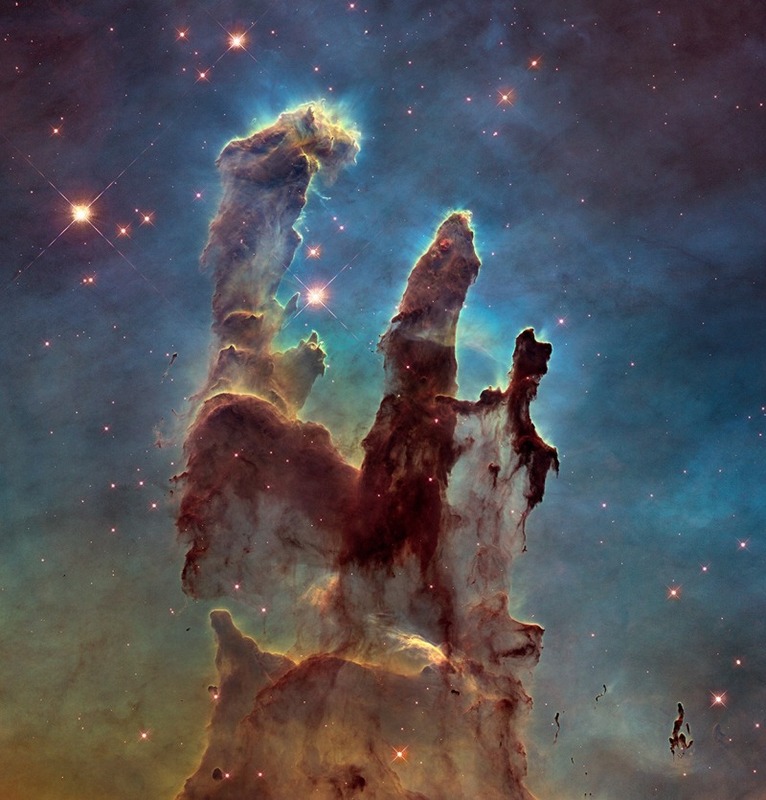 Despite these newly visible stars, some astronomers have noted that the Pillars of Creation would probably more aptly be referred to as “pillars of destruction”. “I’m impressed by how transitory these structures are. They are actively being ablated away before our very eyes. The ghostly bluish haze around the dense edges of the pillars is material getting heated up and evaporating away into space. 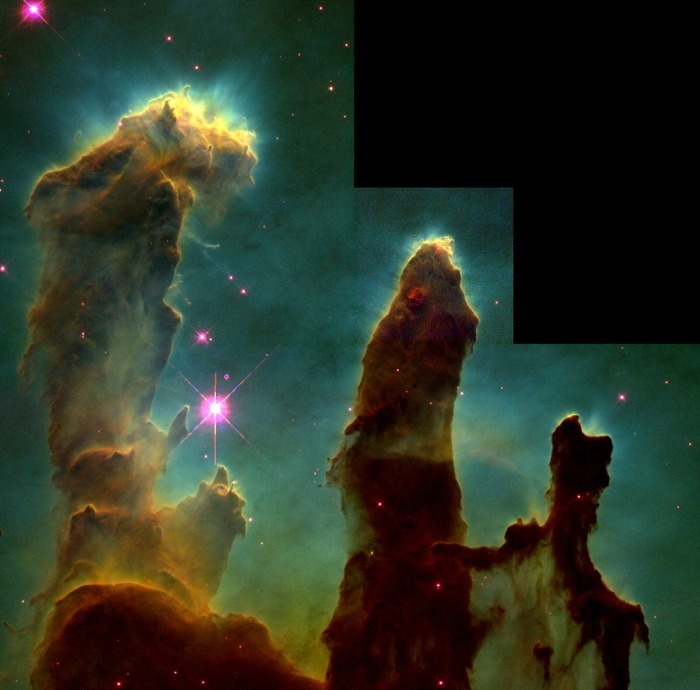 We have caught these pillars at a very unique and short-lived moment in their evolution,” stated Paul Scowen of Arizona State University in Tempe, one of the main astronomers involved in the original Hubble observations of the Eagle Nebula. Something interesting to note — when the 1995 and 2014 images are compared against each other, it’s clear that there’s been “a lengthening of a narrow jet-like feature that may have been ejected from a newly forming star”. In just these last 19 years this “jet” has “traveled” the equivalent of an additional 60 billion miles — at an estimated speed of 450,000 miles an hour. Something else interesting to note is the apparent similarities between the pillars and what is theorized about our the formation of our own solar system — there’s evidence that “the forming solar system was seasoned with radioactive shrapnel from a nearby supernova. That means that our Sun was formed as part of a cluster that included stars massive enough to produce powerful ionizing radiation, such as is seen in the Eagle Nebula”. Those interested in getting very high-resolution versions of the image can find them here.